La Vineria on Via X Giornata was the only place in Brescia that I found offering a degustazione di formaggio. I didn’t look that hard, so maybe there are other places, however it was raining and La Vineria had a covered outside area in a Bolognese style portico. I could sit outside sipping Francacortia and sampling some of Lombardy’s best cheeses. Hurrah. In the past I have asked a waiter what the cheeses were on a plate he had just set before me and he has answered goat, goat, sheep, cow, sheep, before disappearing into the kitchen. Today the owner of the restaurant served me and was much more informative. With the cheese was served a salty bread with a thick crust. A Porsche went past. Then a police car with the lights flashing. In the centre of the plate was a bowl of chestnut honey. On a separate plate was a dash of sweet strawberry preserve and some bitter home-made orange jam. 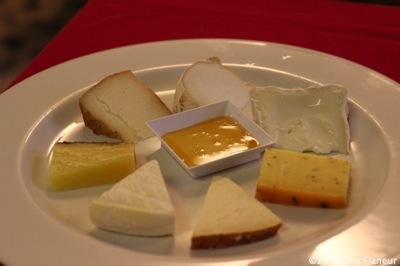 I tasted the cheeses clockwise from one o’clock. (One o’clock being the position on the plate above, not the time. It was actually early evening). None of them had much aroma, but the textures and tastes were very different. And chestnut honey is a definite winner. Quadrello di Bufala is a local pretender to the Brie crown. Not so soft, yet – if it be possible – more liquidy. A gentle taste, this is more about the texture. A lot less like eating butter than the feeling you can get with the wrong type of Brie. Paired with the honey it was delicious, which is doubly amazing, as I don’t particularly like Brie and I don’t much like honey. The orangey cheese at three o’clock was Chiodi di Garofano, an interloper from Holland made with something I didn’t understand. Or rather I did understand, but it seemed to mean nails. Eventually the waiter brought me a plate of these chiodi to see and told me they reminded him of Christmas. I was able to say, ‘Oh! Cloves.‘ An unusual taste for a cheese and one that I wouldn’t hurry back to again. The wine that accompanied these cheeses was a 2011Curtefranca Rosso DOC, made up of 40% Cabernet, 40% merlot, 10% Barbera and 10% Nebbiolo. It had been matured for only 12 months in the barrel, but was a pleasant companion. Spicy, with a good aftertaste, but a bit thin. It reminded me of the younger cousin of a mediaeval monarch. A hint of power but no real authority. A triangle of Pecorino was next, a sheep’s cheese from Salo on the edge of nearby Lake Garda. A hard cheese, salty and crumbly that majors on texture. Robiolo is a soft cheese from the Langhe region of Italy, part of Piedmonte. It is made from a mixture of cow, sheep and goat milk. It had a thin crust and was only a centimetre or so high. Brie came to mind again, although this was softer and flatter. It had the texture of butter and went well with the strawberry jam. Next up was Bagoss, straw-coloured with a dark rind. 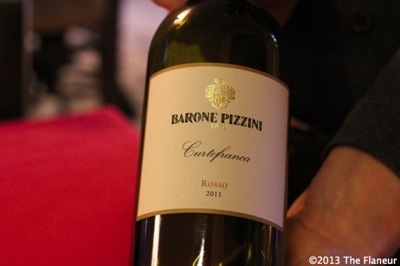 Very local, it takes its name from Bagolino, a town near Brescia. It is made from skimmed cows’ milk and is a hard cheese with a grain that suggests the movement of tectonic plates. Flaky and similar to Parmesan, it was the strongest on the plate. The final two cheese were nameless goat cheeses, the first smoked, the last softer. It made me realise I don’t eat enough smoked cheese. It’s the future. You heard it here first.